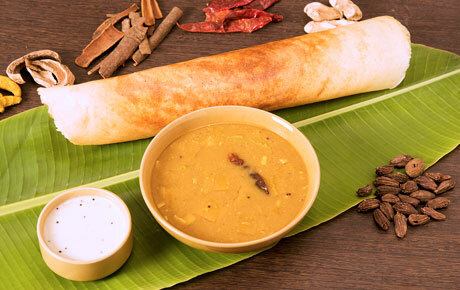 Hide deals from seller "Arya Bhavan "
Click 'Get It' and select Masala Dosa & Medu Vada option, Plain Dosa & Medu Vada option, Butter Masala Dosa & Upma option or Masala Dosa & Upma option. Limit 1 per person and 1 per table. New customers only. By appointment only. Valid Tuesday-Thursday. Promotional value expires 60 days after purchase. $5 for masala dosa and medu vada ($11 value). $5 for plain dosa and medu vada ($10 value). $6 for butter masala dosa and upma ($14 value). $6 for masala dosa and upma ($13 value). Arya Bhavan has separated itself from other local establishments by offering authentic Indian cuisine with a plethora of vegetarian and vegan options. Their outstanding Yelp reviews represents customers' appreciation of the flavorful dishes and the variety of gluten-free, dairy-free and vegan items. This vegetarian-friendly hotspot exudes a casual and comfortable atmosphere, and serves a highly acclaimed Indian buffet. Spice up your palate with this delicious deal. A restaurant in West Rogers Park that serves authentic Indian cuisine.